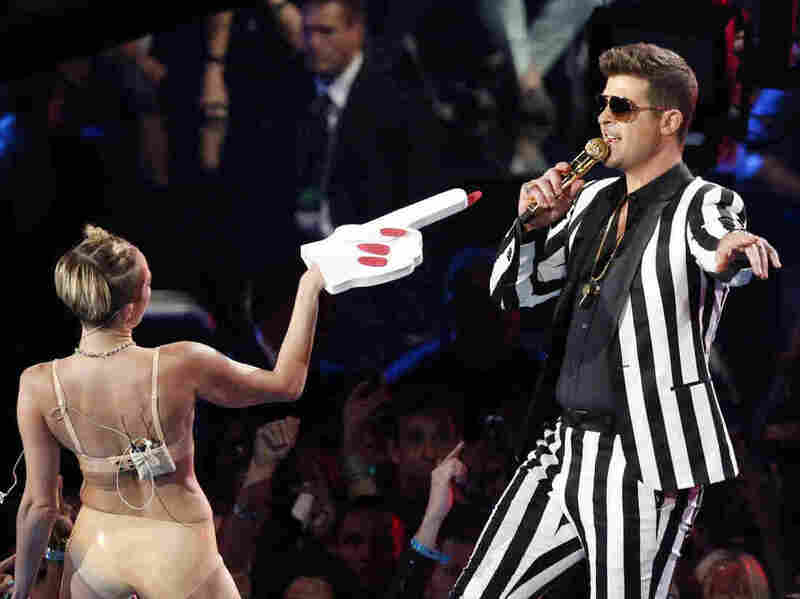 Did Miley Cyrus 'Flirt With Bad Taste' Or Dive Right In? : The Two-Way The young singer's twerking at Sunday night's MTV Video Music Awards is getting tons of attention. Was her performance boring, offensive or great (or possibly all three)? Singers Miley Cyrus and Robin Thicke during Sunday night's MTV Video Music Awards in New York. You may have to turn off your television today if you wish to avoid seeing clips of one-time squeaky clean Disney star Miley Cyrus as she "twerked and gyrated, stripped and swayed," Sunday night at the MTV Video Music Awards. In what's become something of an annual attempt to "shock" the audience (remember Madonna and Britney Spears' kiss? ), it was the not-quite-21-year-old Cyrus' turn last night. "When she reached the end of her song, the singer stripped down to a flesh-toned latex bra and matching underwear and began to perform 'Blurred Lines' alongside Robin Thicke. With Cyrus acting as Thicke's back-up singer and personal dancer, featured guest stars 2 Chainz and Kendrick Lamar went largely unnoticed.
" 'Miley better get a ... pregnancy test after all of that grinding,' joked comedian Kevin Hart during the show." MTV has put video of her performance here. Now, this is far from the most important story of the day (for more on that — the crisis in Syria — click here). But as Ann Powers has written over on The Record blog, pop stars who "first with bad taste" do get folks talking. So we have a question. "A dance move that involves a person shaking their upper hips and lower hips in an up and down bouncing motion, causing them to shake, wobble and jiggle." "MTV has once again succeeded in marketing sexually charged messages to young children using former child stars and condom commercials — while falsely rating this program as appropriate for kids as young as 14. This is unacceptable," Parents Television Council Director of Public Policy Dan Isett says in a statement e-mailed to reporters. Billy Ray Cyrus — Miley's father, who had a hit with "Achy Breaky Heart" back in 1992-- is on the PTC's advisory board. The organization's mission is to "protect children from graphic and gratuitous programming and to restore responsibility to the entertainment industry."